The posterior atlantooccipital membrane (posterior atlantooccipital ligament) is a broad but thin membrane. 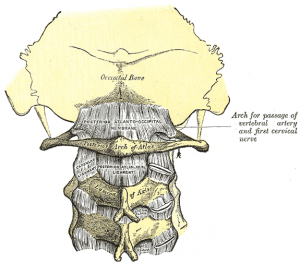 It is connected above to the posterior margin of the foramen magnum and below to the upper border of the posterior arch of the atlas. It is a continuation from the Ligamentum Flavum. On each side of this membrane there is defect above the groove for the vertebral artery which serves as an opening for the entrance of the artery. The suboccipital nerve also passes through this defect. The free border of the membrane arches over the artery and nerve and is sometimes ossified. The membrane is deep to the rectus capitis posterior minor and obliquus capitis superior muscles, and is superficial to the dura mater of the vertebral canal to which it is closely associated.